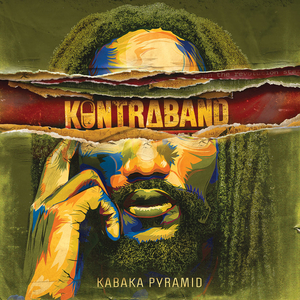 Kabaka Pyramid - Kontraband, 28,46 fr. The debut album for critically acclaimed artist from Kingston, Jamaica sees finally the light in the physical world and will be domestically available in continental Europe as CD-Digipak and 2LP-Vinyl set. "Kontraband" is produced by Stephen and Damian Marley and in fact a double album with great features including Protoje, Chronixx, Damian "Jr. Gong" Marley, Akon and more. Kabaka Pyramid is a conscious revolutionary lyricist with a unique musical style, blending the power, energy and melody of Reggae with the lyricism of Hip Hop. Hailing from Kingston, Jamaica this Bebble Rock Music artist uses his liquid and hypnotizing delivery to spread positive messages of spiritual evolution that forces you to listen. The name "Kabaka" is Ugandan for "King" and the long lasting survival of the Pyramids of ancient Africa represent his desire for longevity in the music and deep connection to Kemetic roots; leaving messages for generations to come. This Award winning artist has developed a solid global fan-base that connects deeply with the messages in his music, touring extensively over the past 5 years to the largest of Reggae stages around the world. Aided by his excellent Bebble Rockers band, he has brought his message and power to tens of thousands of people in North America, Europe, Central America and the Caribbean. Hitting stages such as Reggae on the River (US), Rebel Salute (JA), Sierra Nevada World Music Festival (US), Rototom Sunsplash (ES), Musa (PT), SummerJam (DE), Reggae Sumfest (JA), Reggae Sundance (NL), Reggae Sun Ska Festival (FR), South by South West (US), BoomTown (GB) as well as headlining multiple 20+ multi-city club tours, Kabaka is well known for delivering an electrifying and entertaining live performance. He also concluded the 30 show, United States "Stony Hill" tour with Damian Jr. Gong Marley to rave reviews. Following the global success of his impactful hit single "Well Done" in 2015, Kabaka released his "Accurate" mixtape presented by music superpower Major Lazer and Walshy Fire to tremendous reception with the mixtape proving to be an instant classic amongst reggae/hiphop fans. In 2017 he topped the Global Reggae Charts with the anthem "Can?t Breathe" the first single off his debut full length album "Contraband". The project is being executive produced by Damian "Jr Gong" Marley and is a joint release with Bebble Rock Music and Ghetto Youths International.